Earlier this year, my four year old son interrupted a conversation I was having with my husband about a discussion he had with his boss. “Dad…is your boss a man, not a woman?” he said. “Interesting…” he said, before returning to his game. My husband and I exchanged bemused glances, but it was unsurprising that he would ask this. Most of the ‘bosses’ he knew of are women. His school principal is a woman. He knows my boss is a woman. Here is a genuine sign that as we conscientiously #beboldforchange our efforts are paying off, as evident through the eyes of the next generation. 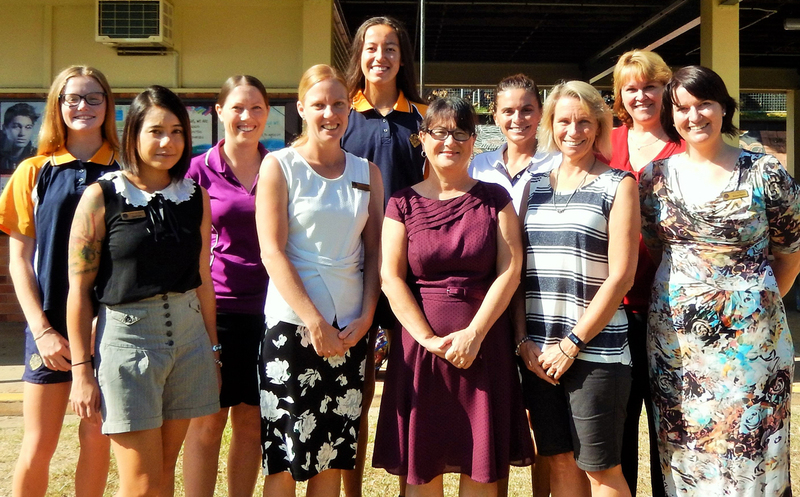 At Gladstone SHS, women in leadership positions is not unusual. Our last three substantive principals have all been female. Terri Byrne, our current principal, is a strong advocate for selecting the best person for the job, regardless of gender. Terri completed her teaching degree with four young children, studying at night. Terri knows that increasing the number of women in leadership positions requires making sure people know they can balance a rewarding career and family life. Many of the school leaders at Gladstone SHS – both female and male – have young children, and Terri supports them to confidently know they can do their job without sacrificing their relationship with their families. This is just one change required to ensure females are adequately represented in leadership positions, now and in the future. Image Caption: Terri Byrne flanked by a selection of the female leaders of Gladstone SHS (l-r): Tia Crosisca (Junior Vice-Captain); Jasmin Castles (Year Level Co-ordinator); Kate Rudd (Year Level Co-ordinator); Courtney Rowe (Business Services Manager); Jacinta Thefs (Senior Vice-Captain); Terri Byrne (Principal); Vanessa Randazzo (Head of Department); Deirdre Burrell (Head of Department); Katrina Burdett (Deputy Principal); Melissa Daniels (Deputy Principal).